If you’re anything like me, you have TONS of sock yarn. 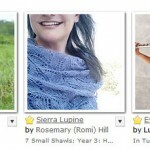 It’s so easy – just one little skein to add to your cart. 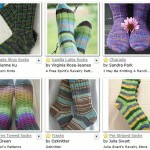 And look at all the gorgeous FOs with sock yarn. Who wouldn’t want to be a part of that club? I’m gearing up for the next My Sister’s Knitter KAL – this one is for Sock Yarn. Perfect! 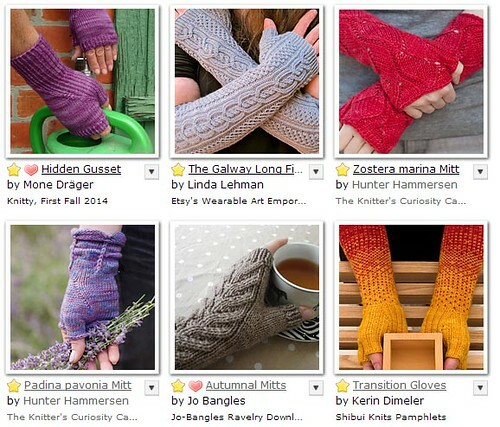 Since the KAL doesn’t start until Sunday I wanted to see what kinds of projects I might be able to make. Lilac – a mostly stockinette sock that looks like a lot more. I’ve knit that stitch before and it was easy to get in a rhythm. 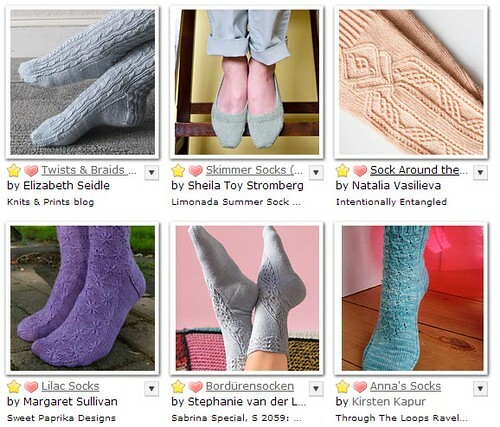 Anna’s – a lovely lace stitch gives this sock some detail without overwhelming the design. It would work great with many handdyeds and solids. 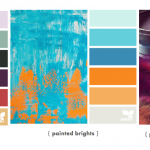 Collinear – another creative use of garter and two colors. I think I’ll cast on this one on Sunday. It’s possible I have some yarn on its way to me. Aubergine – so yeah, a third two-color garter stitch shawl. Obviously I have a thing for them right now. Lots of sock yarn patterns for lots of sock yarn. Maybe you’ll find a new favorite in this bunch. If you have a fave please share it in the comments. I’ll catch you on the purl side. 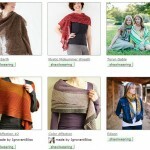 Friday Faves, shawls, socks, yarn. permalink. I think I put almost every one of those patterns in my favorites. 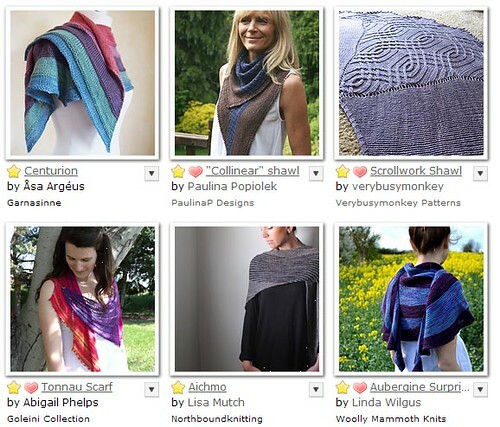 Have you decided what you’re knitting for the KAL? BTW, the links for Aichmo and Aubergine both go to the Aichmo pattern. i found a skein of Citrus (orange) TML to go with a skein of fuschia that i have. i think i’m going to make Collinear with them. i like orange but i don’t look great in it so this will work because i can place the fuschia near my face and still get some orange in there. and thanks for the heads up on the bad link – fixed! Love that pattern, and love orange and fuschia together. Can’t wait to see it. Socks Around The Clock look so lovely. I recently learned how to do twisted stitches and I find it quite enjoyable. 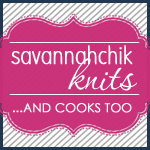 I mistakenly believed that they were cabled stitches for quite some time. i can’t believe that Socks Around the Clock is a free pattern. that’s a TON of work to give away for free. i like twisted stitches too, but not twisted rib. it looks great but i don’t like knitting it. I want to make ALL the patterns! I don’t have enough 2 color combos to make any 2 color shawls right now though sadly. I am also in love with those just like you. There’s just something about them. I can’t wait to see what everyone in the KAL makes! You are always great at enabling us with all the patterns.